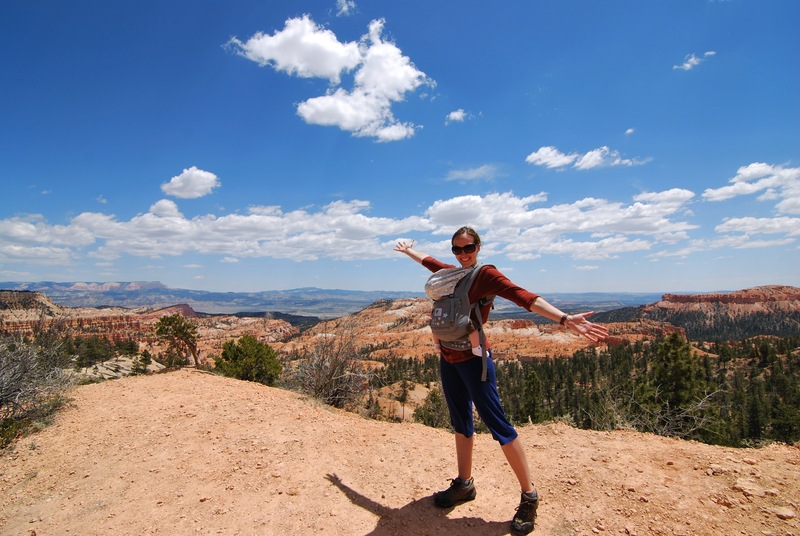 Hi, my name is Stephanie and I am wearing my 7 month old, Sierra, in our Ergo carrier on our recent camping trip to Bryce Canyon National Park in Utah. Normally, Sierra sleeps in the Ergo for all her naps, so on vacation its no different. Actually, the Ergo was our life-saver in many ways: from at the airport claiming baggage and going through security, to having a break from the baby backpack (which she also loves!). My husband Dan wears her in the backpack because its cool and shady, she can look around at all the new and vast surroundings that the trail provides, and he gets to carry some of the weight too! But when she gets tired, the tried and true Ergo was always there for some snuggle time. I love the Ergo because it is quick and easy to get her in there. In this photo, Sierra was ready for some shut-eye but we were in the middle of our hike, so into the Ergo she went. The sounds of silence and our light footsteps brought sleep quickly. Then we got to enjoy the scenery “sans” baby for a few minutes! I love that babywearing gives me the tools to still do some of the things I love. The safety of being on Momma’s chest was invaluable when she needed comfort and reassurance in her new surroundings.